UPDATE: Enjoy these photos of our former home. We’ve moved and are giving our new-to-us home a complete remodel. I’ve completely changed my style! Click HERE to take a look. When you visit my home, you’re sure to find lots of texture. To me, a room without texture is a room without personality! If you have a room that looks flat and boring and you can’t quite put your finger on the problem, maybe texture is the missing element. 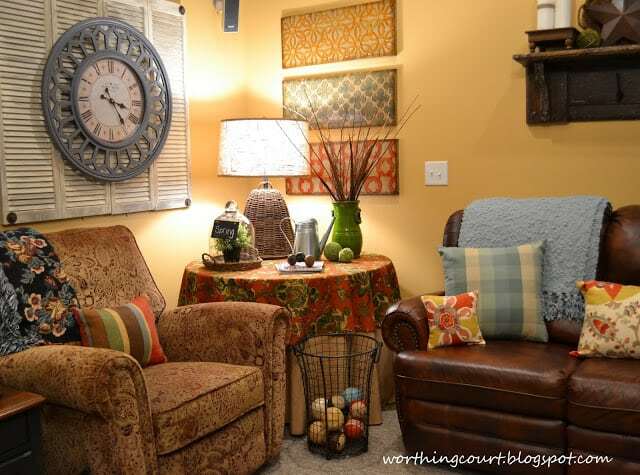 Here are 7 easy and quick ways that you can texture to your home without a lot of effort. 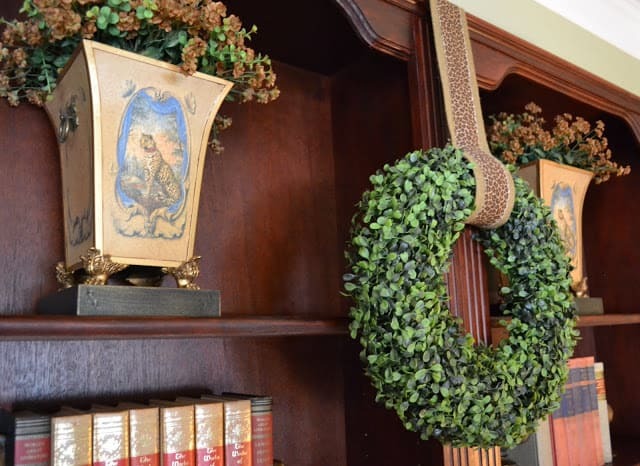 Hang a wreath or a piece of art on the front of a bookcase. It doesn’t have to be permanently attached. Use Command Strips or create a loop of fabric, wrap it around the wreath and thumbtack it to the top of the bookcase. You can’t go wrong with using natural elements to add texture. Mother Nature does the work for you! 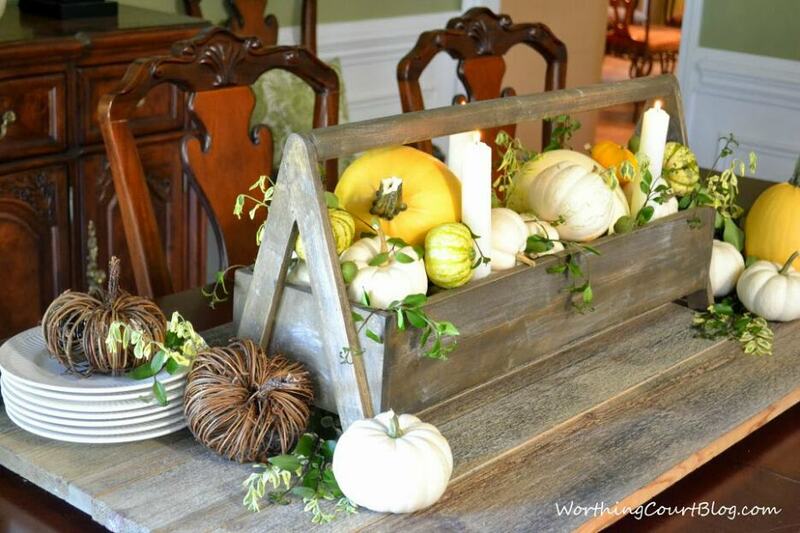 Adding sticks and twigs to containers is a favorite of mine. Just take a walk outdoors to collect all sorts of sizes and shapes. Try tucking bits of live greenery into an arrangement. Moss and rattan decorative orbs are one the easiest ways in the world to add texture and take practically no effort at all. 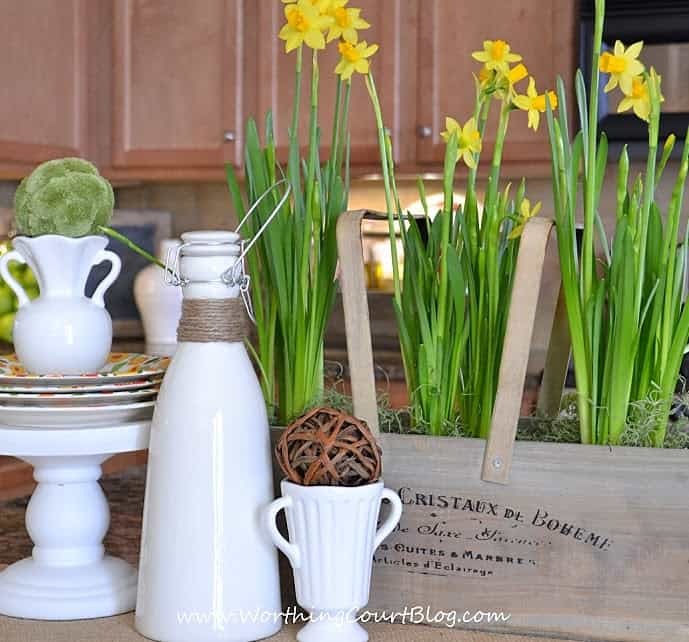 Tie a strip of burlap around a container in a vignette. Adding pillows is pretty much a no-brainer way to add texture, but did you ever think about using pattern to add texture too? 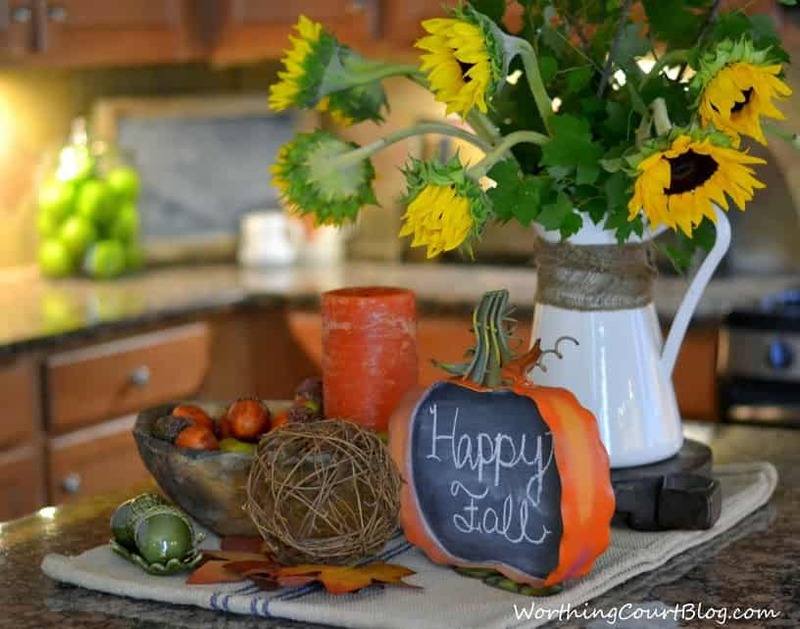 And lastly, don’t forget to add texture outside of your home too! 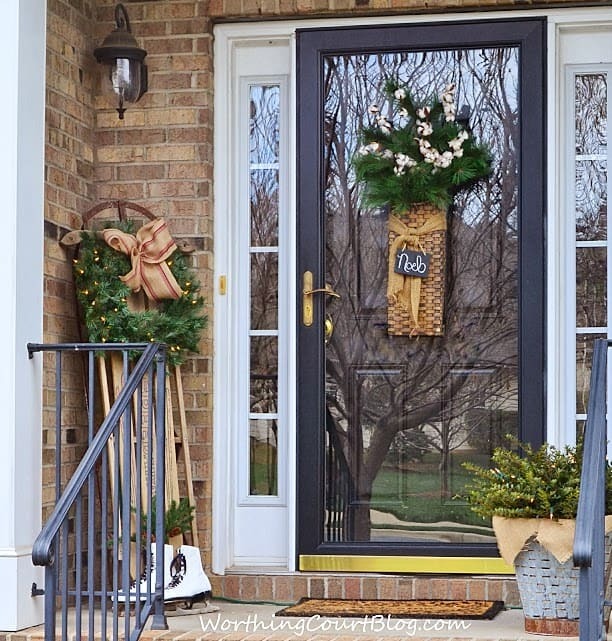 My front porch this past Christmas is filled with easy ideas for adding texture – a scrap of burlap in a container, a basket on the door and lush faux greenery, just to name a few. 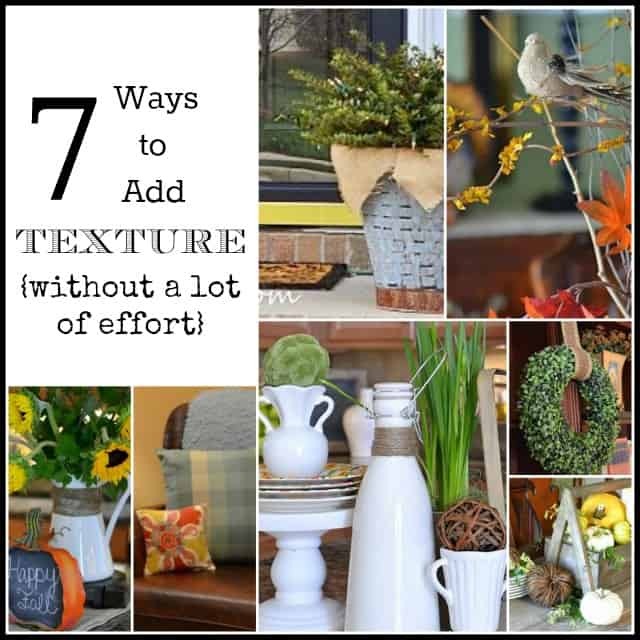 Do have any favorite ways to add texture to your home? Lovely ideas as always, Suzy! Suzy, this is a great post. 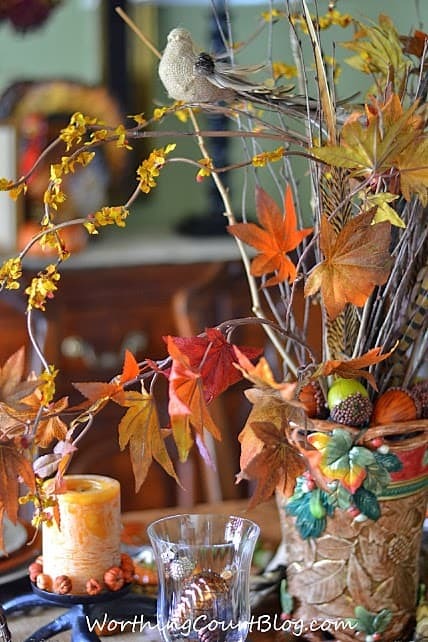 Love all your pretty vignettes. I especially love your bookcases. I’m all about texture these days! You have some fabulous ideas here!